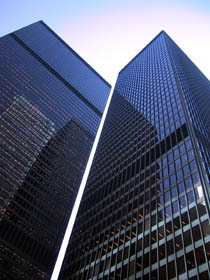 The TD Centre consists of six towers: the Ernst & Young Tower, Royal Trust Tower, Canadian Pacific Tower, 95 Wellington, Maritime Life Tower, and the tallest of them all, the TD Bank Tower. Aside from these six towers, there is a pavilion at the base of the TD Bank Tower that houses the TD Canada Trust Main Branch (known as the Toronto Dominion Main Branch). 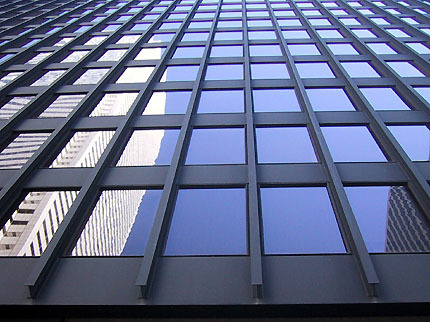 "The two-storey banking hall in the plaza is among the best spaces Mies ever made. As you are visiting the branch you will find yellow flowers in a fishbowl vase on the service counters just where Mies had put them." The original idea for the TD Centre was to create the largest concrete building in the British Commonwealth at that time. With the advent of several obstacles despite key connections, the original idea was scrapped and Mies van der Rohe entered into the picture. 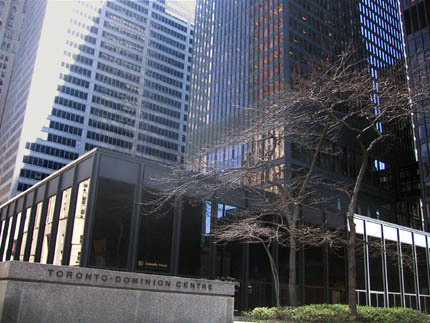 The TD Centre was commissioned by Allen Lambert, the chairman of the Toronto Dominion Bank until his retirement in 1978. 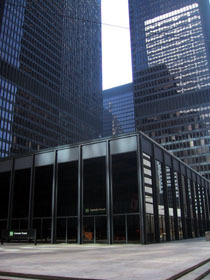 The building features the typical Mies van der Rohe's black steel I-shaped beam on the facade. The building is basically comprised of black steel elements and glazing. 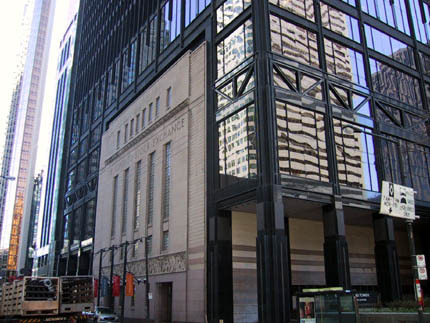 Also as part of the complex, the old Toronto Stock Exchange building was incorporated and converted into the Design Exchange building that can be accessed from Bay Street or inside the complex. There are many renovations ongoing in the underground levels but the main structure and facades remain the way they were since the 1960s. The TD Centre is located in the block surrounded by Wellington Street to the south, York Street to the West, Bay Street to the East and King Street to the north. The underground floor for the TD Centre connects all 6 towers with series of shops and services. The connection is part of the PATH system that links portions of Downtown Toronto through underground shopping corridors. The PATH portion is open to the public whereas the upper floors are limited to the office occupants. The closest subway stops are St. Andrew located at University and King, or King station located at King and Yonge. There is access to the PATH system through these stations. In summer time, the open area on ground level often hosts concerts and events during lunch hours. For more information please visit www.tdcentre.ca or call +1 416 869 1144.
copyright © galinsky 1998-2008. e-mail info@galinsky.com.